Hi Mal, Wholesale Pricing is not intended for discount voucher codes. Hi Hoko, I’ll put up screenshots after the migration of Wholesale Pricing to a WordPress Plugin; coming soon! The current implementation will do all of the above for you with a retail Price then discounted pricing levels for custom user levels (subgroups). Hello, can you put some screenshots? Can this be used for discount voucher codes? i.e insert voucher code for 5% off the total price into a submit box? note your “Contact page” link at the top of this content area is broken. Hi Kimberly, thanks for the idea. This could be achieved through a custom Product meta called ‘member-price’ or the similiar with a value of ‘Kimberly|1033|10’. This would give a discount of 10% to Kimberley on Product ID 1033 ‘Headphones’. Do you have an option to do pricing on a per product/per person basis. Is this possible? If not, how much would it cost to make this an option? Excellent, then this will do what I need. Just need to do a bit more discovery regarding design for WP eCommerce and then present solution and cost to client. Thanks! Retail users are considered users that are not logged in, guests if you will. OK super, this helps me very much. Let me ask you… if a person comes to the site to make a purchase, are they required to login to finish purchase? Or must they register first to purchase? Or is that only an option if I require registration. Ideally I’d really like to keep the purchase process as simple as possible for Retail users especially. So that they come, pick out their products, put them in the cart and check out via Paypal. I don’t mind having to train my client to issue a login or teach her wholesalers or distributors how to login to get the Wholesale and Distributor purchase rate. And would you happen to have a per hour support rate if any custom mods needed to be done to get this all working? If so either post here or email me your rate. I am not a programmer (designer) and so I just like to know if that assistance is there at an hourly rate if needed. I apologize for all the questions.. but you know how it can be in discovery phase. 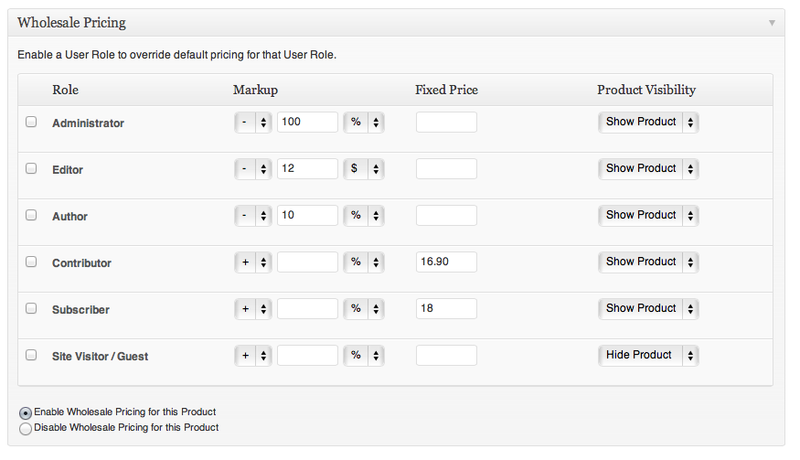 To answer your first question, you can create multiple Roles and apply varying discount levels on the Sale Price. 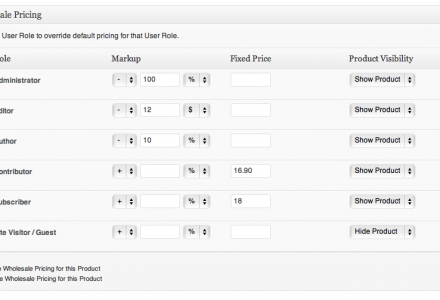 Once a user logs in their user role is checked against the pricing levels adjusting the Sale Price of Products. Customers get priority support through the Live Support and Support Forum here on the site. Early adopters of my Plugins receive lifetime updates, as this Plugin matures a major version/subscription model may be introduced but will only affect new customers. 1.) Do I assign logins for my different groups? The client I am thinking of using this for has 3 customers. a. ) Retail: the pricing for retail would be freely shown on the web site on a store page. This is for a visitor who comes to the site to make a purchase via a trade show, SEO etc. They get no discount unless they are given a coupon code to apply to purchase. How do we differentiate each customer “user” type. Is it by sign up, checkout etc? 2.) Does my purchase of this product come with any sort of support. If not, can I purchase premium support and if so what is the generally turn around time for answers to questions and assistance with the product integration with the site? 3.) Do I get lifetime upgrades of this product when I purchase it? I have a few ideas for this …. if I use it with something like s2member – would I be able to have premium membership subscribers to have different prices than the others as if they were wholesalers? 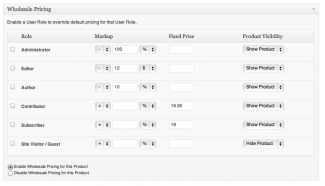 I am not sure how the s2member plugin works like if it creates new user roles in the settings and then once that happens I can assign prices in your plugin according to those that were just created. That’s correct, you can create a Custom Role with the Custom Roles Plugin and then adjust the settings within this Plugin. I am interested in purchasing your plugin, it sounds like it’s exaclt what I need. I just want to make sure that the User Roles are customizable and I can name them anything I want. In other words I am not limited to Subscribers, Wholesalers, Staff, etc, correct? Hi Dan, I’ll contact you directly shortly.